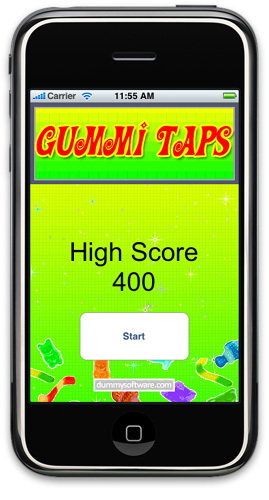 Enjoy the fun of chewy gummi bears right on your iPhone with the easy-to-play, finger-gripping game, Gummi Taps! The object of the game is simple. Just tap the gummy bear, gummy worm, gummi shark, gummy fish, and gummi cherry to score 10 points. As yummy as that sounds, Gummi Taps advances in difficulty with each point scored, so keep your focus on the iPhone screen and get ready to tap away! How many gummies can you get? Extremely easy game-play, simply tap the gummy bear, gummy worm, gummi shark, gummy fish, and gummi cherry to score 10 points. Features 8 different gummies, 6 different backgrounds. 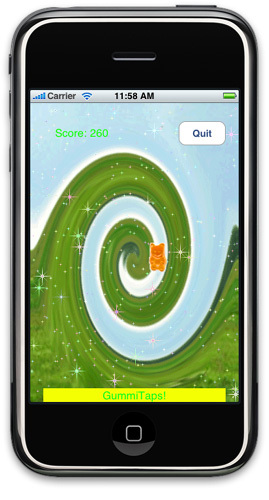 Unlimited level of challenge awaits those with top gummy tapping skill! Tap the gummi bear to score 10 points! It starts off easy, but increases in challenge with each successful tap. How high of a score can you get?